I read somewhere that liquid/cream blushes were better for people with bumpy skin, at least compared to powder blushes. Liquid and cream brushes are also better for creating the ‘chok chok’ glass skin that I’ve been trying to get for ages. Sadly, most of my blushes are the powder type (I only have one from Etude House that’s liquid), so I really wanted to get more of them. Innisfree also released this cream blush last year, I think slightly later than Etude House, so I didn’t get around to buying it immediately. As I was about to run out of my Etude House liquid blush (the tube is really small + I always squeeze out too much by accident), I thought that maybe it was finally time to give this one from Innisfree a shot, so here it is! 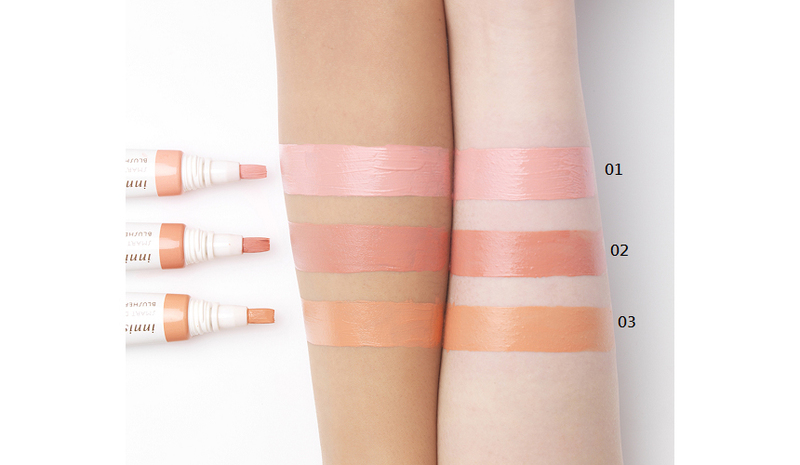 Cream blusher aimed to express lively cheeks with moist color development. I do find it rather interesting that they have included so many natural extracts (such as camellia, citrus etc), although I’m not sure if they actually do have any skincare benefits. Another ingredient to look out for is parfum (fragrance) – a potential irritant for people with sensitive skin! Packaging: This is definitely much easier to control and use than the Etude House one. It highly resembles its lip balm packaging, and is very easy to squeeze an appropriate amount of cream blush out. The brush is a very good addition – I didn’t like how the Etude House blush required me to use my own fingers to dab on the colour, because its staying power was good that it stained my fingers. In this product, the product comes off directly on the brush and you can simply apply the blush on your cheeks without dirtying your hands. As convenient as it may be, I do have some gripes with the brush. Although it makes for easy blending afterwards, it’s very hard to actually see how much product you have squeezed out until you realize it’s too late (LOL). Colour: I bought shade 02 , which is darker and a bit less pink than Etude House’s PK001 but I think still a very nice colour to use if you are on the tan side and have warmer undertones. Colour payoff & intensity: This product shows up really well on skin, so even if you don’t use too much product, you can definitely see the colour clearly. I do think that it can get a little too intense though, so best to use as little product as possible, or you will have to spend time brushing away the excess colour. Staying power: Liquid and cream blushes definitely have much better staying power than that of powders (which tend to disperse, if that’s the correct word to use) after a long period of time. I would say this Innisfree blush is pretty good if you are looking for a long-lasting one. Everything about this product is really good – except the brush problem. It’s not so serious that it puts me off from using it, but I just don’t like knowing that I always waste so much blush because I can’t see exactly how much I am squeezing out. Maybe it’s just me? Idk. Let me know if you face the same problem with similarly packaged blushes! I’ve never tried a cream blush before! I think I might have to check one out and see how it works for me. Great review! Never seen a cream blush with that type of applicator. The problem I usually have with them vs powder blush is that when I blend the cream I remove some of the foundation underneath. Do you have that issue? Does the brush on the Innisfree blush help with that? I think this applicator brush tip is really clever for #KBeauty blush, since Asian makeup style tends to go higher up near the orbital with blush than in the U.S. where it is applied lower on the cheek bone– and the brush applicator is similar to some concealers so it is perfect for the same area under the eyes 🙂 I kind of like Innisfree– tried one of their masks, I did like it better than The Face Shop (because I keep mine in the fridge and TFS one got really alcohol smelling but the Innisfree didn’t) and it was refreshing.